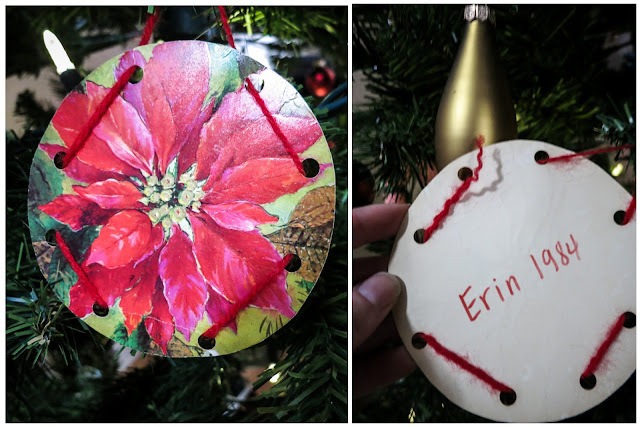 The Christmas cards are in the mail, the baking is in the oven, the gifts are under the tree... sounds like you have some time to get crafty with me! 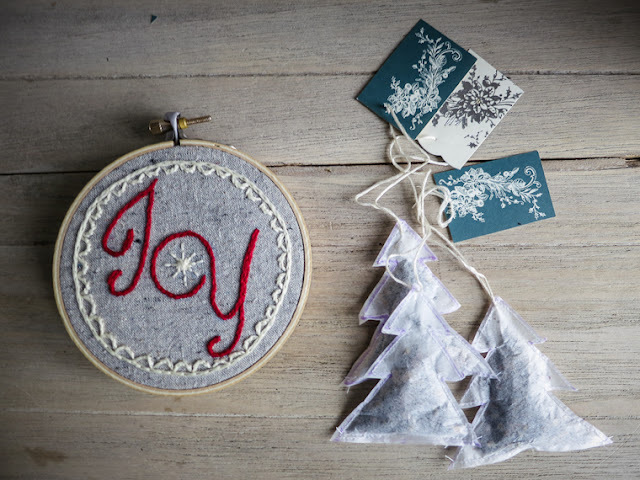 How adorable is this embroidered ornament and those Christmas tree tea bags? They are both perfect either as small gift or party favour or as an extra special gift topper, but the best part is, they are super easy and quick to whip up. 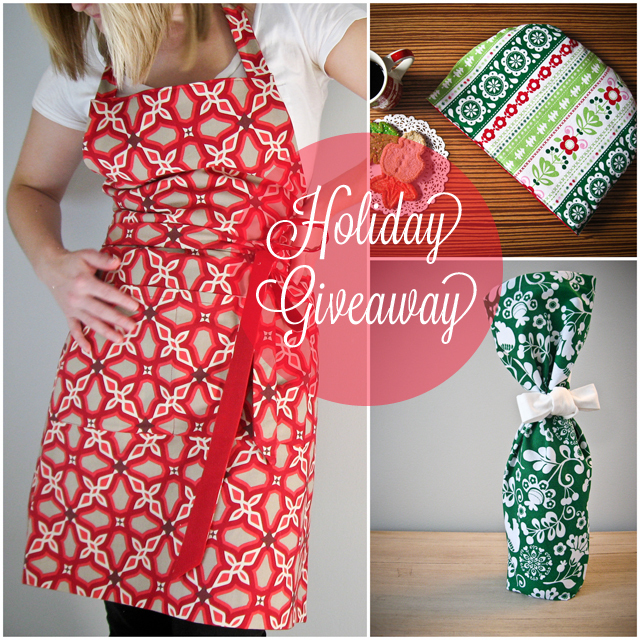 Gather your materials, pour a glass of wine, and let's do this! After seeing this beautiful blog post, this tea lover couldn't resist giving these a try. And now that my sewing room is covered in tea leaves, I figured a few more detailed, and English, instructions were in order. 1. 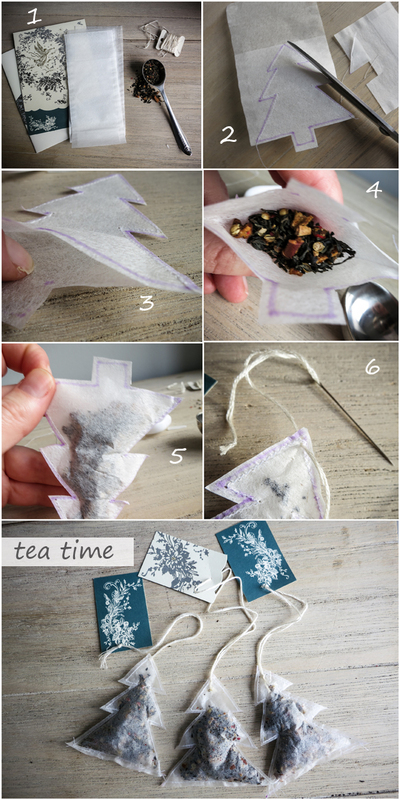 Supplies: looseleaf tea (I used Tealish's Christmas blend), tea filter bags, needle and thread, scissors, and old Christmas cards or wrapping paper for the tag. 2 & 3. Draw a Christmas tree shape on the bag. Sew around the tree, leaving the bottom open. If using a sewing machine, be gentle -- paper is lot more delicate than fabric. Cut as close as you can to the seam. 3. Fill with about a teaspoon of tea. 4. Gently shake the leaves through to the tip of the tree. Sew up the end. 6. 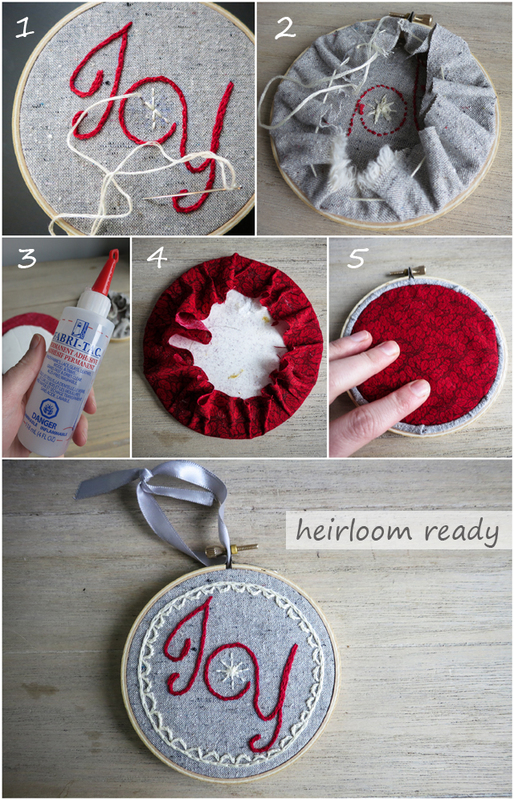 Thread your needle and draw it through both the top of the tree and the paper tag. Tie in a knot. You're done! My embroidery practice continues. This one turned out so cute that I had grand plans of making a bunch of them in time for the craft show. But, as usual, I overestimated my time and ended up completing just this one. Haha! I'm now planning to put one of these on every gift. I never learn. Supplies: 4" embroidery hoop, two 5x5 pieces of fabric for front and back, embroidery thread, needle, fabric glue, foam core board or thick cardboard. 1. Click here to download the Joy image. Trace it onto fabric. There are lots of ways to do this, but I like to use a combination of carbon paper and a vanishing fabric marker. Add the snowflake and border freehand with your fabric marker and embroider away using your preferred stitch! I used a split stitch here. 2. To finish off the back, sew around the edges in a circle and pull tight, like a drawstring. 3. On a piece of foam core or thick cardboard, trace around the inside of another 4" hoop and cut out. Place this onto the other piece of fabric and cut approximately 1" beyond the edge of the board. 4. Line the edge of the board with fabric glue and press the edges of the fabric into place. 5. Add more glue on the back of the disc and press into the back of the hoop. String some ribbon or string through the top and you're done! 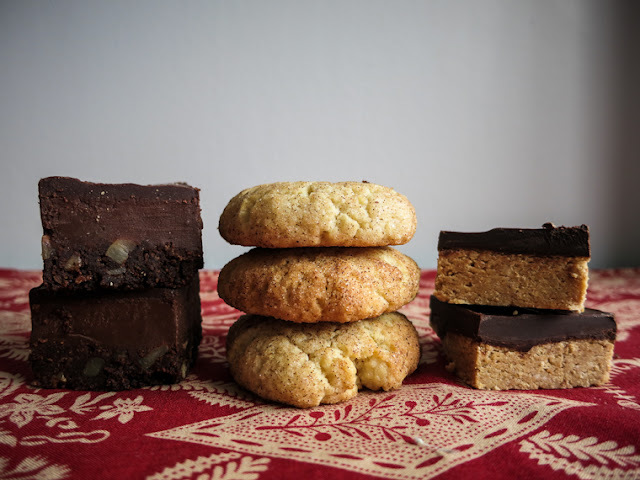 I've been thinking about this year's Christmas baking ever since we started planning our kitchen renovations and the experience was everything I dreamed it would be. Counter space, a convection oven and a dishwasher really do change the whole game. So with my new kitchen backing me up, I decided to try a few new recipes, and they all turned about great! No crumbly caramel disasters this year. I suspect it's going to be hard to keep these around for another week! I can't technically call these cups, since I decided to save myself the trouble and just cut them into squares. But they are just as delicious as the cups we all know and love, just upside down. If I had to choose a favourite of the three new recipes, this would be my pick! 1. In a saucepan on the stovetop, melt 1 cup of unsalted butter. 2. In a stand mixer on low setting, or mixing by hand with a wooden spoon in a medium bowl, mix together melted butter, graham cracker crumbs, icing sugar, peanut butter and vanilla extract until combined. 3. Pour into the baking pan and spread evenly along bottom of pan. 4. In a double boiler (or using a ceramic or metal bowl over top of a saucepan of low boiling water), melt the chocolate. 5. Pour melted chocolate on top of graham cracker layer and spread evenly. 6. Place in refrigerator to set, about 30 minutes. 7. Using a circular cookie cutter, punch out circle shaped peanut butter cups! Or just cut out into squares (or some sort of shape) with a knife. 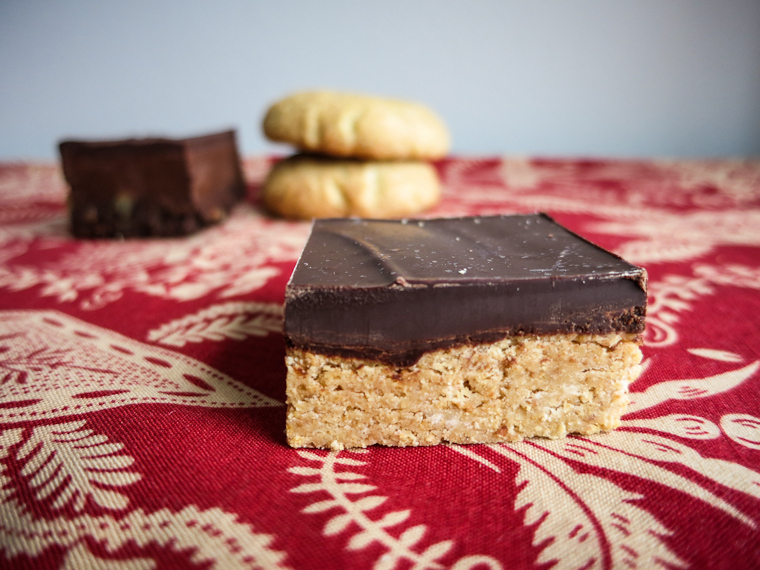 Imagine that nanaimo bars joined a biker gang... this is what they would look like. These bad boys are seriously rich, triple rich to be exact: a chocolate crust; a soft, spicy chocolate centre; and a hard chocolate top. But don't let their decadence intimidate you, just make sure you cut your squares small and pour a glass of milk before you dig in! 1. Preheat oven to 350°F and line a 9-inch square pan with parchment paper. Set aside. 2. Combine graham cracker crumbs, walnuts, cocoa powder, sugar, salt and orange rind in a bowl. Add egg and melted butter and stir until well combined. Scrape mixture into prepared pan and use your fingertips to press it down into an even layer. Bake for 10 minutes or until crust looks matte and is dry to the touch. Set aside. 3. Pour whipping cream into a small heavy pot. Use a mortar and pestle to crush cinnamon stick, allspice and cloves into coarse pieces (this will be strained out later, so you don't have to go crazy). Add crushed spices and chili flakes to cream. Bring cream just to a boil over medium heat. Remove and let stand 20 minutes to steep. 4. Heat oven to 325°F. 5. Place chocolate in bowl. Return cream to medium heat and bring just to a boil again. Immediately pour through a strainer onto chocolate. Let chocolate stand 30 seconds, then stir until melted and smooth. Stir in egg until just combined. Pour chocolate mixture onto prepared crust and bake in the oven for 18 to 20 minutes or until just set with a slight wiggle in the centre. Cool and chill for 30 minutes or until firm. 6. 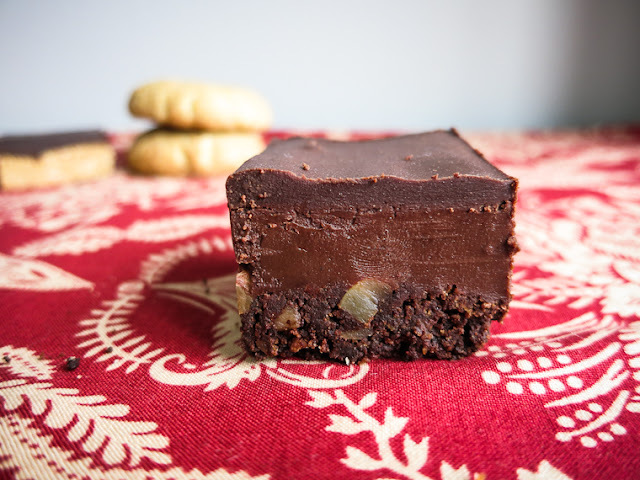 Melt butter and remaining chocolate in double boiler or heavy-bottomed sauce pan and spread evenly over top layer. Chill for another 30 minutes or until firm. Cut into squares. 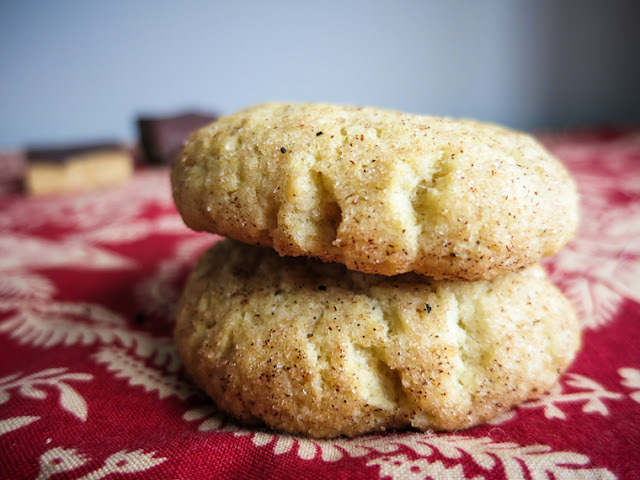 A nice break from all the chocolate, these are kind of like a cinnamon roll in cookie form. If they weren't so sweet already, I'd be tempted to ice them. They didn't turn out as flat as shown in the original recipe, but they are still light and fluffy, as promised, and difficult to eat just one. I burned a batch (still getting used to that new oven), and the commentators seem to insist that cream of tartar is necessary, so maybe I'll give it another go with a more traditional recipe. Heat the oven to 425°F. Gently melt the butter in a saucepan or in the microwave and let it cool while you mix the dry ingredients. Stir together the sugars, flour, spices, baking soda, and salt. Whisk the eggs into the cooled butter and add the vanilla. Stir the wet ingredients into the dry ingredients, stirring just until it comes together. In a soup plate or shallow bowl, mix together the white sugar, cinnamon, and nutmeg. Form small 1 1/2-inch balls of dough and roll them in the cinnamon sugar. Place them on an unlined, ungreased baking sheet and flatten slightly. Bake for 7 minutes then remove and let cool on the baking sheet for 5 minutes. Remove to a wire rack. The dough can be refrigerated for up to 5 days, well-wrapped. It can also be frozen in logs. O tannenbaum! Decorating the Christmas tree is such a lovely tradition, isn't it? 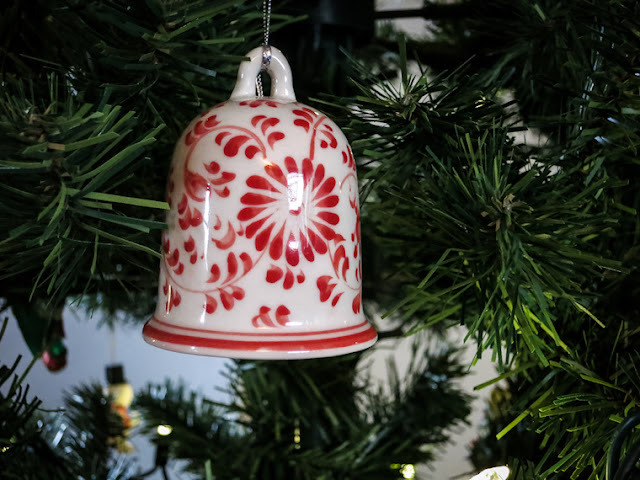 Each ornament seems to have a story all its own and I really loved reading about some of Carla's favourites last year. I believe she got the idea from her friend Joanne the year before. So this year, I think I'll take up the tradition and share some of the trinkets on my tree! Next to my Baby's First Christmas ball, this is the second oldest ornament on my tree and one of my very first sewing projects. Not bad needlework for a four-year-old! I wonder if I should track down my kindergarten teacher and thank her for that? Mike bought me this ornament for our first Christmas together in Hamilton. If you love Christmas as much as I do, you will understand how much this means to me. I can't help but wonder if our grandchildren will be hanging it on their tree one day and sharing this story. Sorry for the sap, but if there's a place for sap, it's on the Christmas tree! Har har! I bought this at the Maker's Market last year from a local stained-glass artist (I feel horrible that I can't remember the gentleman's name). 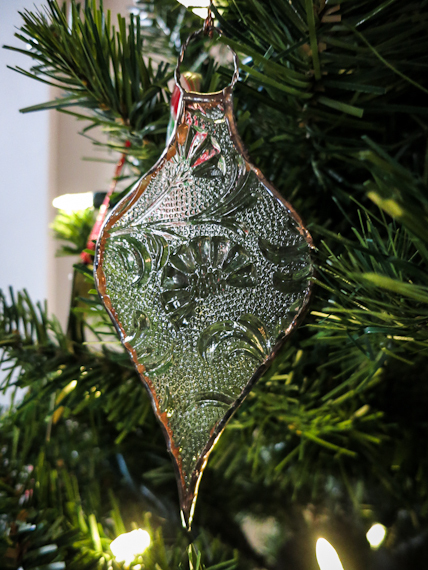 This ornament is beautiful on its own, but what makes it extra special is that the glass was actually taken from an old home right here in Hamilton. I obviously fell in love with this idea and bought four or five more to give as gifts. My mom dropped off a bunch of my ornaments this year that were gifted to me as a child and I was quite surprised to find this one included. It was a gift from my godparents and it's always been a favourite of my entire family. It was a bit of a tradition to find the perfect spot on the tree for this beauty and everyone knew the rules — in front of a light and with lots of space to hang. Haha! I could go on and on, there are so many that I love, but alas it's Day 4, so I'm cut off. Maybe I'll share some more next year. 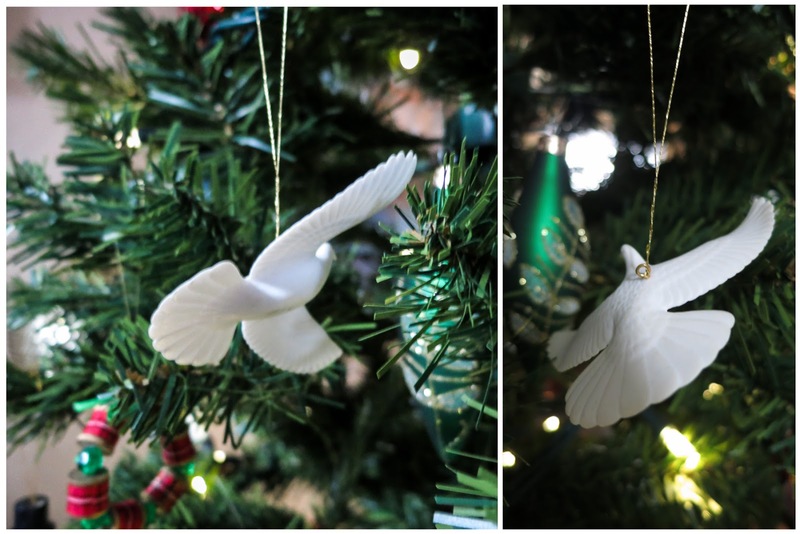 What are some of your favourite ornaments and family decorating traditions? 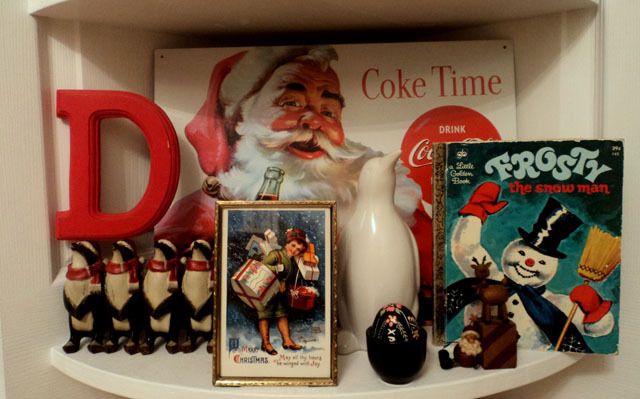 Season’s Greetings, Dear Edna readers! It’s Carla from DeFacto Redhead here, giving a helping hand to Erin for Day 5 of her 12 Days of Christmas posts. Last year I wrote on her blog for Day 6, and I discussed my obsession with Pyrex and the resulting fascination with all things vintage kitchen. 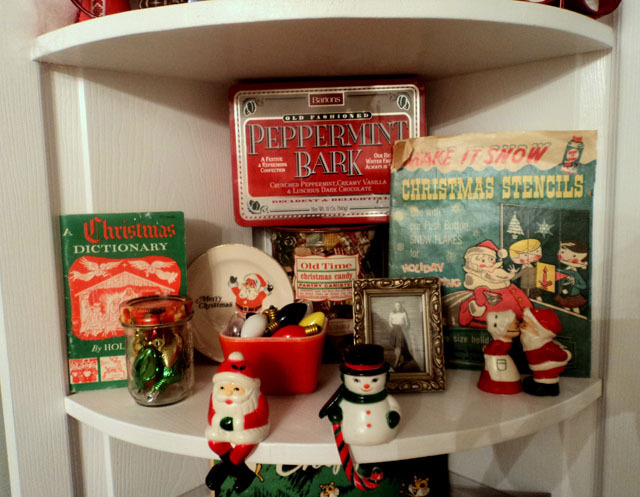 This whole dishes thing is an interest I share with my mom (Jill, from A Little Bit of Everything), and this year we are still on the vintage track, but have veered way over into vintage Christmas. We are also pushing our “door shelves” on anybody who will listen. My mom discovered this hot-ticket item on…Pinterest (surprise! ), and my dad, being the handyman that he is (and also being completely worn down by our repeated requests to “build us that shelf”), finally acquiesced to our pleas (i.e. demands). 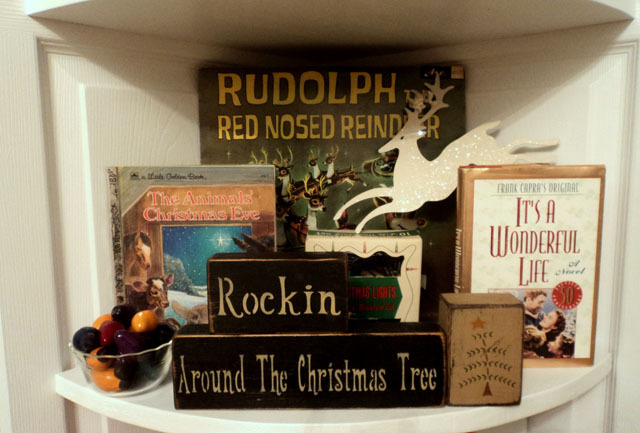 The result is pictured below, and I have decorated it for the first time with vintage Christmas finds I have picked up throughout the years, with special items that used to belong members of my family, and with knick-knacks that mean something to me and my “beau,” Darcy. It’s no secret that I am a sentimental person, and as Edna herself would likely say, this five-shelf display is a perfect reflection of my personality. “Dear” reader, consider us acquainted. Here is the door shelf, in all its glory! I do believe I hear In Excelsis Gloria every time I look at it. 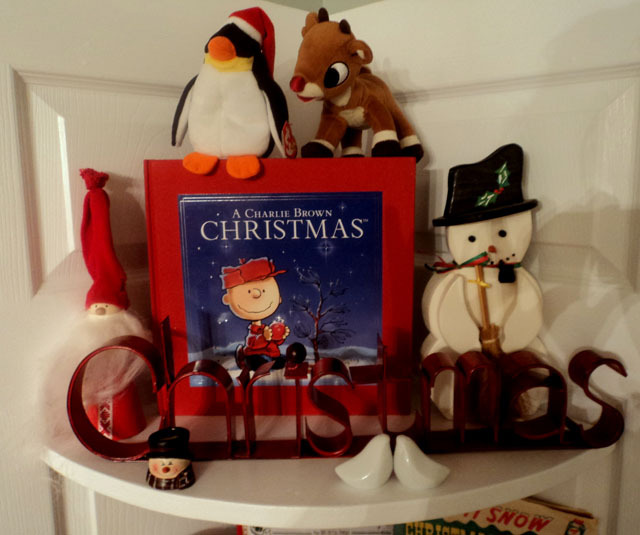 Technically, nothing on this shelf is vintage (the Charlie Brown book is from 2008), but my dad did make the wooden snowman for my great-grandmother in 1994 (there is an inscription on the back), and come on, let’s get real — it’s A Charlie Brown Christmas, people! 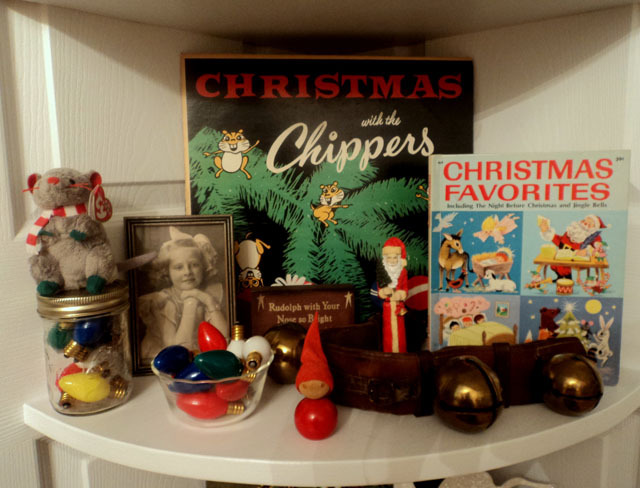 The Christmas Favorites book on the right has a 1951 copyright date, and I find the Christmas with the Chippers record interesting because it was made in Canada, specifically “Scarboro,” Ontario. How long ago was the Scarborough we know today spelled without the “u-g-h” on the end? Everyone must remember their Little Golden Books from when they were kids – I know I certainly do! I don’t recall having the book on the left, but this copy of The Animals’ Christmas Eve must have made somebody happy around the copyright date of 1977. This Little Golden Book — Frosty the Snowman —is inscribed “Best Wishes for Jay J. in 1973, Grandma H.” I remember having this book, too, and I’m sure I loved it. After all, if it’s Christmas related, I’m pretty much sold. Art Crawl / Dec. 14 / James St. North / A great opportunity to pick up some unique gifts and support some amazing small businesses. Make sure to stop in to Needlework for the special Handmade Holiday Market presented by Mint Textile Studio. Kitestring Christmas Spectacular / Dec. 14 / Hamilton Conservatory for the Arts / This fourth annual bash will feature live music, dancing, "mountains of snacks", and sweet alcoholic treats. All profits benefit Culture for Kids in the Arts. Toronto All-Star Big Band / Dec. 15 / 2 pm / Hamilton Place / I had the opportunity to see this big band play last year and was blown away. These kids can really belt out the oldies. I've been wanting to see their holiday show ever since, unfortunately, something always seems to come up. This year is no exception, so I'm counting on you to attend and report back, OK? Sonic Unyon Christmas Party / Dec. 15 / Now in it's 21st year, I think it's safe to call this event a Hamilton tradition. I remember attending as a teenager, so, yeah, it's like, pretty old. Ha! This year's lineup includes Terra Lightfoot, New Hands, Kestrels vs Electroluminescent, and Cardboard Nationals. Vinyl Cafe Christmas Tour / Dec. 19 / 7 pm / Hamilton Place / Stuart McLean is bringing a special holiday edition of his popular radio series, The Vinyl Cafe, to the stage and is making a stop in Hamilton. I don't follow the show, but if you do, you may like to know that the concert will include two brand new Dave and Morley stories and Christmas music performed by “The Vinylettes” and Vancouver singer-songwriter Reid Jamieson. 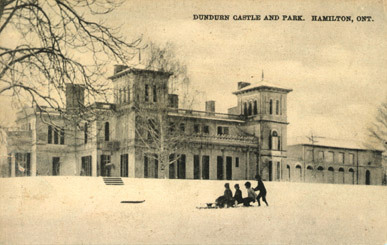 Dundurn Castle / until Dec. 23 / There are some wonderful events planned for Dundurn Castle this entire holiday season, from baking and craft workshops, to caroling and, of course, seeing the castle all decked out for Christmas. If you want a sneak peak, the Beaux Mondes ladies wrote about their recent visit here. A special treat for you today... we have a new guest blogger joining us, Jessica Rose. Jessica is a writer and editor who lives (but unfortunately doesn’t work) in downtown Hamilton. When she’s not editing children’s books, she's blogging at www.notmytypewriter.com or tweeting at @NMTblog. Please give her a warm welcome! What's the perfect gift for a book lover? The easy answer is, of course, a book, but unless you know exactly what someone has read or likes to read, buying for a book lover isn't always as easy as heading to the best-seller section. 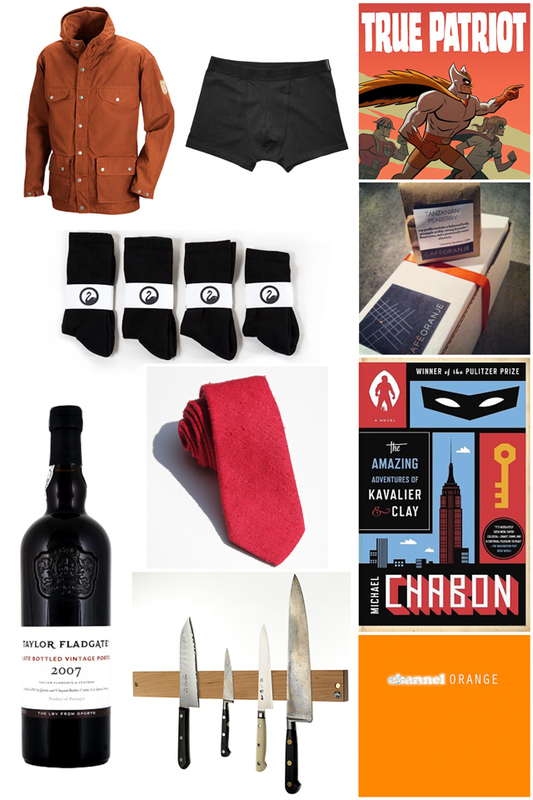 Here are a few unique and local gifts that any reader or writer on your list will love. 1. Quills Magnetic Bookmarks: Anyone in my family will tell you that Quills magnetic bookmarks are a personal favourite because each has received at least one from me over the past few years. These perfect stocking stuffers are available by appointment at the Quills studio on Arkledun Avenue, or at the Royal Botanical Garden's gift shop, the Paper Place in Toronto, Chapters in Ancaster or Erin Mills, or at Rustic Routes in Beeton, Ontario. 2. A Child's Christmas in Hamilton: Written by Ryan Moran, and illustrated by Chelsea Robinson, A Child’s Christmas in Hamilton is inspired by Moran’s own experiences growing up in Hamilton in the 1980s. This pocket-sized book is available at a number of independent retailers, including Mixed Media and Citizen Kid (188 Locke Street South). Proceeds from the sale of the book go to City Kidz, a charity that helps support children in the inner city. 3. 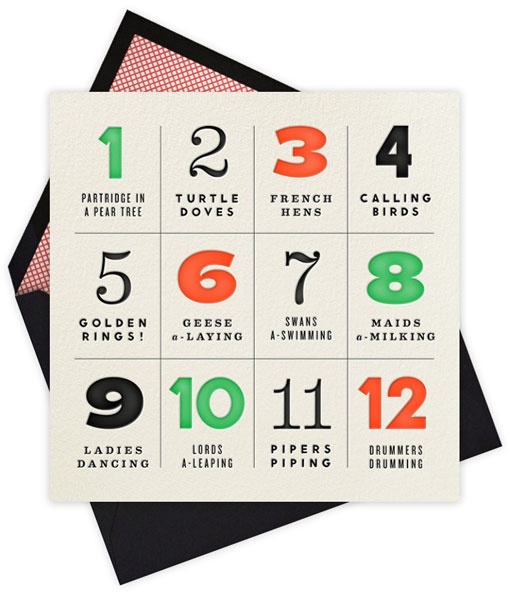 Pull-Down Educational Chart: Sheri at Gritty City Goods offers one of the most unique gifts for language lovers — this etymological chart of the English Language. Sheri printed this chart, and her many others, fashioning it in the style of a vintage pull-down map. It’s not too late to contact Sheri to arrange a pick-up of one of these unique gifts. 4. Hamilton Illustrated: A unique book like David Collier's graphic novel Hamilton Illustrated is better than something plucked off the shelf at a big-box store. Hamilton Illustrated, which was released in November, is available at Mixed Media (154 James Street North) and independent booksellers across the city. 5. Book Jewellery: If the reader or writer on your list is a jewellery lover, Laura at The Unwritten Word uses recycled pages of novels to create her necklaces, bracelets, and earrings. 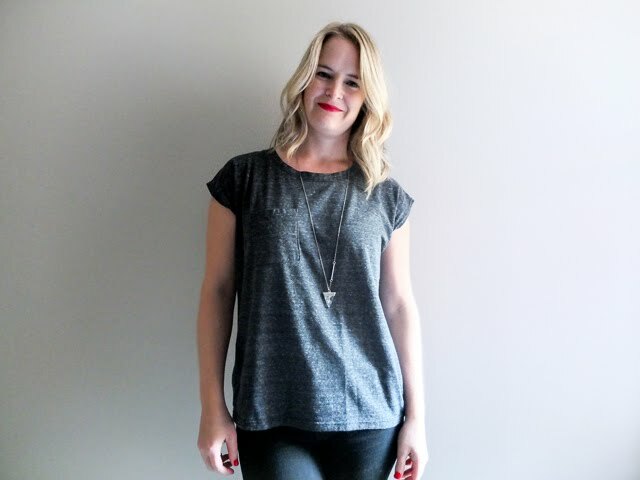 Laura’s shipping deadline has passed, but if you live in Hamilton, Ancaster, Burlington, or Brantford, she’ll hand deliver your gift for free, as long as your order is placed before December 21st. Just enter the promo code HAMMER. 6. You Can Do Anything in Hamilton Tote: If the book lover on your list is anything like me, he or she needs a good tote bag to lug books home from the Hamilton Public Library. Russell Gibbs' You Can Do Anything in Hamilton totes are large and durable enough for a haul of hardcovers, also sporting a message that captures the spirit of the city. It's available at White Elephant (133 James Street North) and Tourism Hamilton (28 James Street North). Hamilton is one talented city, I'll tell you. 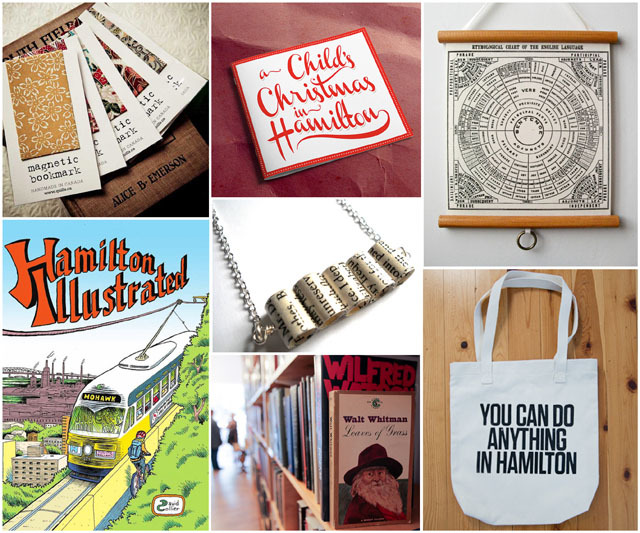 Here's proof: eight beautiful gifts from eight very different Hamilton makers. I'd be thrilled to receive any one of these, wouldn't you? You really have no excuse... buy local! 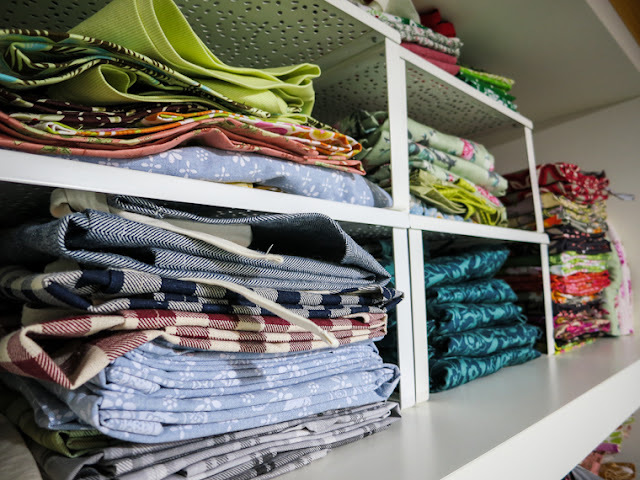 It's safe to say I know a thing or two about sewing, and aside from the usual staples like fabric, thread, and a decent sewing machine, there are a few extra tools and gadgets that I've discovered throughout the years that I'm not sure I could live without now. 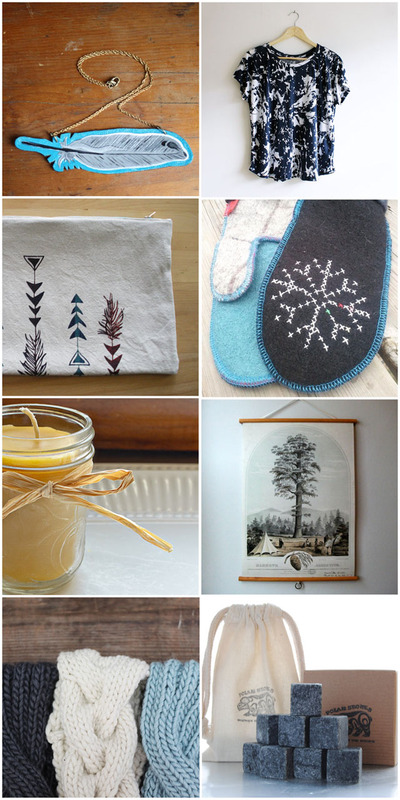 So, if you have a person on your list this year that likes to sew, you're in luck, there's surely a few things here that they will love in their stocking! 1. 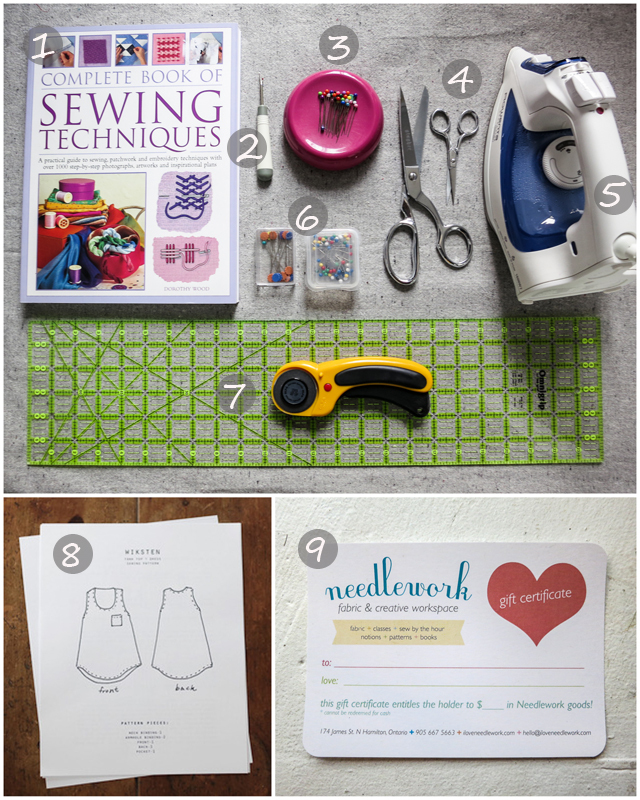 Sewing Basics Book: There are lots of sewing books out there, but I highly recommend this one. Mike bought it for me last Christmas and I turn to it often to research everything from fabric types, to sewing machine problems, to embroidery stitches. 2. Ergonomic Seam Ripper: A seam ripper is probably the most used sewing tool next to a needle and thread for beginners and advanced sewers alike. The tiny go-to dollar store variety works just fine, but step it up to the ergonomic version and your fingers, back and eyes will all thank you. 3. Magnetic Pin Cushion: At first I thought this was a silly novelty, but oh how I was wrong! The real value isn't in being able to pick up all your pins at once (how often do you need to do that? ), but how you can basically toss your pin in the general direction of the thing without even looking and it snaps in place, allowing you to keep your eyes on your work and your machine running at full speed. You know you want to try it! 4. Fabric Scissors: Nothing compares to a pair of good fabric scissors, so this is a tool you shouldn't skimp out on. I love my handcrafted Gingher Shears, and they have a lifetime no-questions-asked guarantee. It's true, I've used it. A pair of little embroidery scissors or snips is also a must-have for light trimming. 5. Iron: Non-sewers would be surprised at how much ironing is involved in sewing. In fact, for some projects, I think I spend more time behind the ironing board than the sewing machine. An investment in a good quality iron, like my darling Rowenta here, goes a long way. 6. Pins: Quality pins save quite a few headaches as well. I recently started using long, flat quilting pins and now I reach for them first. Because they're larger, you catch more fabric with one pin, you can place a ruler flat on top of them, and these particular ones can be safely ironed over! 7. Rotary Cutting Set: This actually consists of three things, a rotary cutter, ruler and cutting mat. Together they make the cutting process ten times faster and more accurate. But please be careful... I've nipped off fingertips. Oops. 8. Patterns: This can be a tricky one unless you know your friend pretty well, but you know it's the thought that counts. My advice: don't overestimate skills, keep it pretty simple and beginner-friendly, like this Wiksten tank. Some other pattern companies I like are Burda, Collette and Megan Nielsen. 9. Gift Certificate: A lot about sewing is personal and subjective, so don't underestimate the value of a gift certificate to a local fabric shop. This way your sewer can choose their own fabric, thread, tools, or even sign up for a class! My top pick so far is this Fjällräven, Greenland jacket with an attached tight fitting hood and two-way zipper (allows adjustment for better movement while biking), plus it’s available locally. Runner up is this one. It has two-way zip, and the fabric weight is a bit lighter for spring. The downfalls are the hood is removable, which means a looser fit than I like for biking, and the logo is a little too prominent. Also, the name K-Way reminds me of BiWay and how bad my peers would mock me if I wore it in grade 6. 2. Undies: I’ve read good things about this underwear brand and realized O’s Clothes carries them through the magic of twitter (guess I was in the rain-jacket zone). 3. Pre-Order True Patriot (released in July): I’ve been reading a couple graphic novels a week from the library the past few years because I got too-cool-for-comics from 16 until about three years ago, when I started scrambling to catch up. Throw in some Canadiana and I'm sold. The time-honoured parental staples of socks & undies have now been covered. It includes three samples from a who’s who of Hamilton roasters (Detour, Hero, Red Hill, Speakeasy & Homegrown). Topped off with your choice of Cake & Loaf cookies. Gotta order quick though, offer ends Dec 12th. *If anyone is wondering: 1,2,4 & Shortbread for me. 6. Late Bottled Port: A winter standby in our house, when we run out of this stuff it means we’re wineless and cranky. So bring one over just to be safe. 7. Red Tie: I bought a ratty old red plaid tie for like two bucks for a costume; it was full of holes in the lower half, but I liked it so much I started wearing it with sweaters to hide the holes. All that sweater friction has now caught up with it, but I've confirmed there's something behind this red tie thing. 9. Mag-Blok magnetic knife rack: With our kitchen update this year we decided to ditch our crusty old knife block. Instead of wasting space on the counter again, this sturdy 12” wood rack with a continuous magnetic field will keep our knives secured and out of the way. Wow! I guess I'm into monochrome this year, huh? I found it pretty difficult to narrow my list down to eleven. You may call that greedy; I prefer to call it admiring beautiful things. You may find a few extras hiding in this list. Don't tell. 1. This beautiful hammered brass cuff by Leigh Luna is engraved with with Live, Love, Create in braille. How perfect is that? Now, while we're on the topic of brass, I also love this Laura Lombardi necklace, but it will put a slightly bigger dent in your wallet. 2. I'm a recent loose-leaf tea convert after finally tasting some decent, strong black-tea blends. From what I hear, Bellocq is like the Cristal of the tea world. 3. Jane Labatt, one-half of the duo that owns White Elephant, launched a stunning jewellery line this year called Rare Specimens. These shiny galena studs are one of my favourites. I like the herikimer diamonds too, if anyone is interested. 4. If you're going to drink loose leaf tea, you need an infuser, and I've had a hard time finding one that I like. This sleek gadget seems to solve all my issues. It's called the Blomus Utilo Tea Stick, and I want it! 5. It's going to be hard to replace the gorgeous Rifle Paper Co. calendar I've been admiring all year, but I think this beauty by Leah Duncan will do nicely. I also think this one by Cranny Found Favorites is sweet. 6. How cool is this handmade Celtic knot by Karen's Rope Work? Our kitchen renovation has us suddenly having to adjust to laminate countertops as opposed to tile. Trivets are in order STAT. 7. This lacey crochet hook case by Namolio has been bookmarked for a loooong time. I think it's because I keep telling myself that I can sew something similar myself. But, let's get serious here, is that ever going to happen? And will it look half as pretty as this? 8. Another thing I can't seem to buy for myself is a covered cake dish, also known as a cake dome set, apparently. This is most likely because it wouldn't fit in my old kitchen. But now I have a new kitchen. Mmhmm. 9. The Fire Starter Sessions by Danielle Laporte. To be frank, this is a self help book with balls. All I needed to do was read the table of contents to know that I wanted to own this book. It will be an inspiring new year with this on my shelf, I'll say that much. 10. Although I like to think of myself as Carrie Bradshaw when I wrap my laptop in a pashmena, it's undoubtedly not ideal protection for bouncing along in the metal basket of a vintage bike. This Acme laptop case would work much better, except that it's an inch too small. Maybe Santa's elves can make me one just like it that is 14x10.5? 11. In our house, we opt for fabric napkins and tea towels over paper whenever we can and they're all starting to look a bit... um... used. I've had my eye on this ship print by Jenna Rose for awhile. Local artists Bookhou and Bespoke Uprising have some lovely screen-printed designs as well. 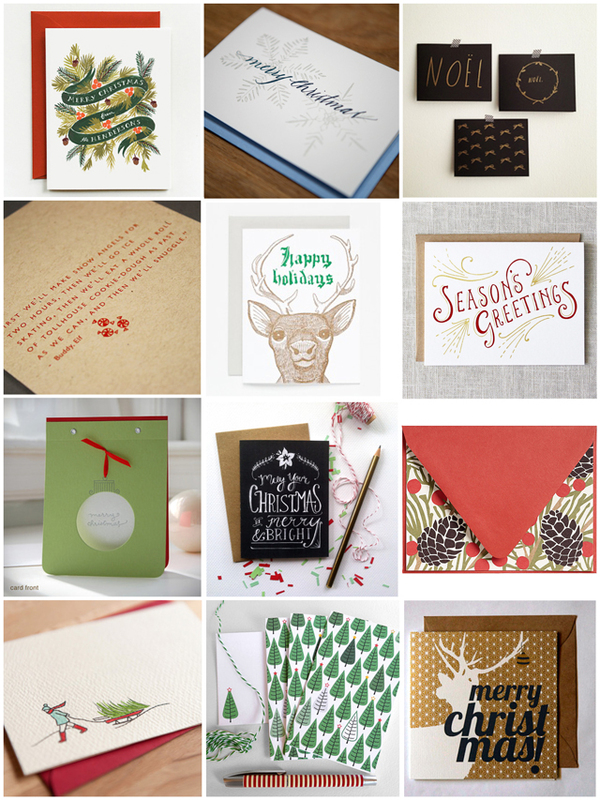 I'm kicking off the 12 Days of Christmas series with one of my favourite holiday traditions... Christmas cards! I hear your arguments that it's the digital age and that I receive only a fraction compared to what I send, but that's all part of the reason I do it. This is the one time of year where I overindulge my love of stationary, take the time to show all my loved ones that I care, and get excited to open my mail box every day! That being said, I still haven't purchased my cards for this year! That doesn't mean I haven't seen some that I like. It's just that I send about thirty cards and the ones I love most are of course hand crafted and thus out of my budget. 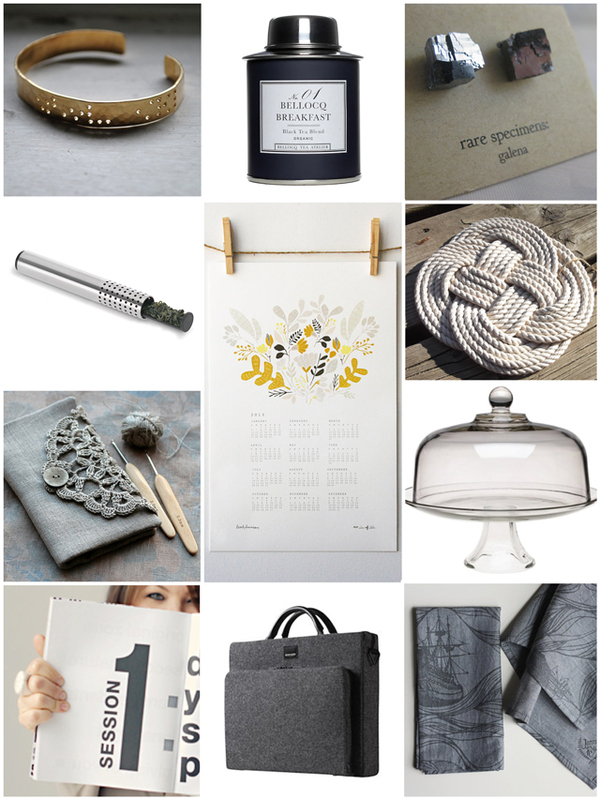 Nevertheless, here are some of my favourites from around the web. If I don't find what I'm looking for this week, I just may have to bite the bullet and express ship some of these beauties. Wouldn't you want to be on my mailing list then? I've been on the fence about whether or not to continue my 12 Days of Christmas series again this year. On the one hand, it's a lot of work at an already crazy busy time. On the other hand, I really love doing it! These are some of the posts that I look back on throughout the year and smile, so happy that I took the time to research and write them. So, with that in mind and the festive spirit in my heart, I've decided to give it another shot this year, despite there only being 3 weeks until Christmas. That's 4 posts a week. Ahhh! I'm going to need some help. I've had fantastic guest bloggers contribute to this series in the past, such as Jentine from My Edit, Bess from English Muffin and Carla from Defacto Redhead, but this year I'd like to hear from a few new voices. If you'd like to contribute a post, please pitch your ideas to dearednashop@gmail.com as soon as possible. I look forward to hearing from you! What a fantastically crafty weekend! The Maker's Market went really well. I was impressed with the overall setup and organization, the atmosphere was cozy, the customers were friendly, and business was good. All in all it was a very successful day. Thanks to everyone that came out! With the craft show behind me, and some extra cash in my pocket, on Sunday I headed out to Toronto for the last day of the One of a Kind Show. I won the tickets from Katie Walker, a local silkscreen artist who was a first time vendor in the Rising Stars section. A big thank you to her for that. I had a great time and saw a lot that I liked this year. I even came away with a couple gifts for Mikey J. My Christmas shopping has begun. Yay! My online shop has been bumping all weekend too! There must be something that clicks for people on December 1st telling them to get shopping. It's a good thing too, because those shipping deadlines are closing in. U.S. customers have only until December 5th for made-to-order items and until December 9th for ready-to-ship. Canadians have a bit longer, but not much. It's wise not to gamble with Canada Post, so please get those orders in this week! All the information you need is posted on the home page of my shop, but feel free to email me if you are at all concerned about your item making it under the tree. December is off to a great start for me so far! What have you all been up to? Decking the halls and trimming the trees? I plan on getting to that sometime this week. Do you think I have enough stock? Haha! The funny thing is, it still doesn't feel enough. I guess that's the nature of the job — there will always be more things to sew. Contrary to how it might look, I didn't post this picture to brag about my productivity. I wanted to pop in to remind you that I'll be at the Maker's Market Holiday Show this Saturday. Tomorrow! 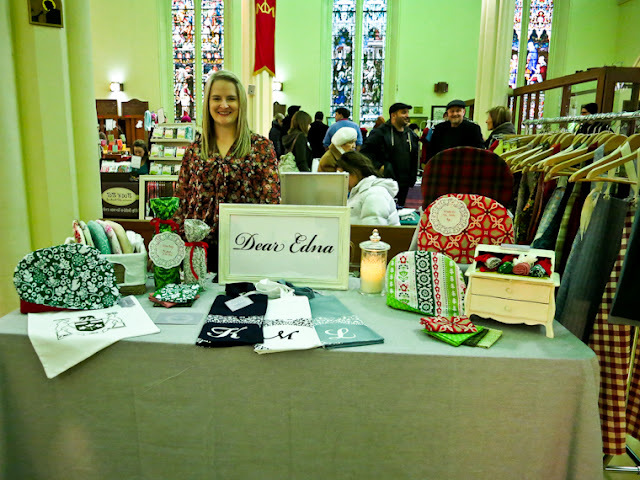 For the first time in Dear Edna history, everything for sale online is ready to ship and I will have it all with me at the craft fair, plus a few extras, like new aprons that I haven't listed yet and fun holiday goodies! Christ's Church Cathedral, 252 James Street North, 10-4. I hope to see you there! 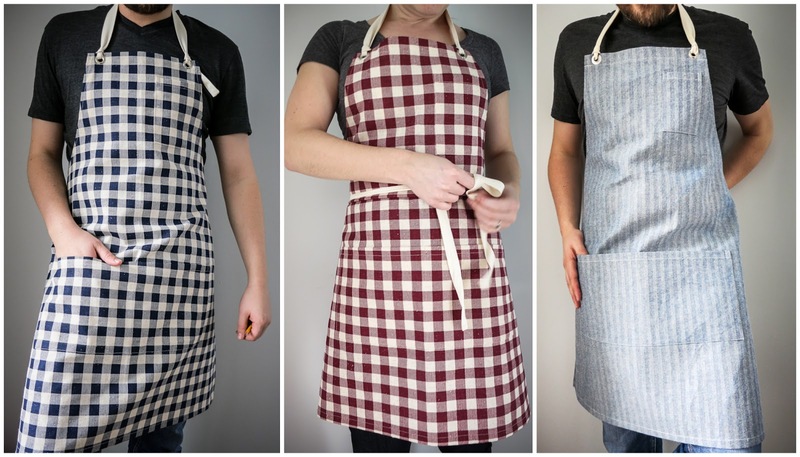 Three new aprons were added to the shop this week. Instead of just new prints, these were actually built from a completely new design. They've been in the works for about a year, so I'm pretty excited that they're finally for sale! A lot of thought went behind each feature, so I thought I'd share a few stories of how they came to be. Technically these aprons were designed with a man in mind, but I think they look good on women too, particularly the red check. 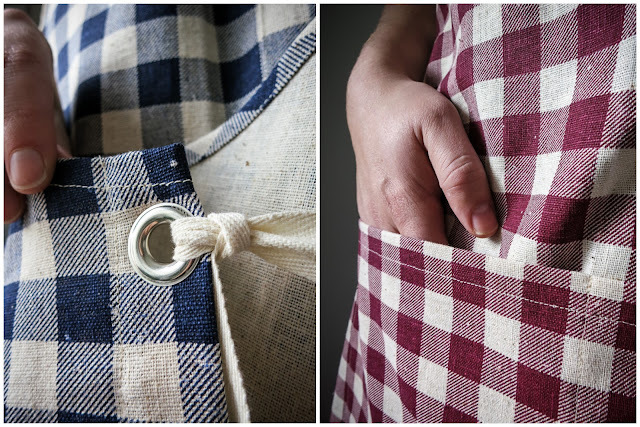 Both the gingham cotton and the denim are durable, heavy-weight fabric, so I wanted the apron to work not only in the kitchen, but in the garage as a work apron too. Besides the fabric, the only feature I could find distinguishing a kitchen apron from a work apron was the tiny breast pocket. So I added one. And I like it. The one thing about an apron that most affects the fit is the neck strap, so I was determined to make it adjustable on this design. Adding grommets allows you to easily tie all the straps wherever is most comfortable. It doesn't hurt that they look cool too. By the way, setting grommets is not as easy as it looks. After a couple trips to Tundra Leather and whacking every surface of my workshop, an Ikea cutting board on the bathroom floor seemed to be the only process that worked. 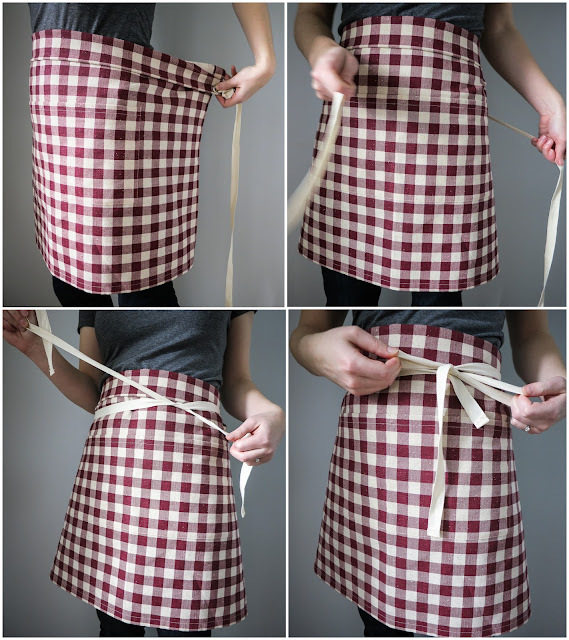 Try not to picture that every time you put on your apron, ok? Another word on straps. Without launching into a sewing tutorial, all you need to know about sewing straps here is that the difficulty level increases as the strap decreases. With this desinn, the straps had to be pretty skinny to fit through the grommets and tie, so I decided to use twill tape instead, which is like a cotton fabric ribbon. 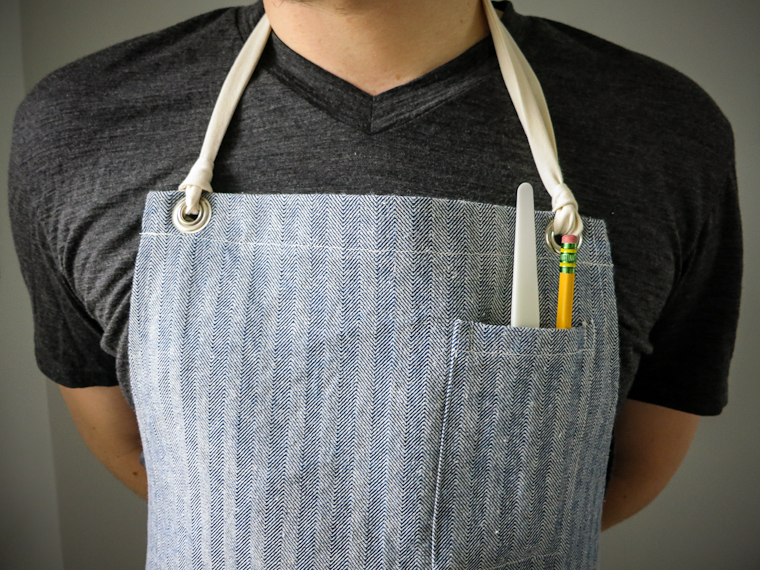 However, once we tried on the apron, we realized right away that the twill tape was too uncomfortable on the neck. Back to the drawing board. After several tries, I ended up with a sewn strap that is one-inch thick at the neck and tapers towards the ends to tie around the grommet. Your neck can thank me later. Finally, completely by accident I discovered that because you can remove the neck strap, this apron can easily be converted to a half apron! Huzzah! I still get requests all the time for the navy plaid denim apron I sold out of in June, so hopefully these will be an adequate replacement. If you ask me, they're better! Please visit my shop for more pics and details. Confession time. I've always been envious of people who make a living from knitting and crochet. I picture them snuggled up in a comfortable chair, covered in luxurious layers of warm wool and watching endless hours of TV. Of course this seems heavenly compared to hunching over a sewing machine, but this is no doubt a grass-is-greener situation, as I'm sure fibre arts come with their own aches and pains, frustrations and curse words. From the sounds of it, reality is a combo of both: here to tell us how it is, is the lovely Soli of Soli Knits. My name is Soli and I have been knitting for as long as I can remember. 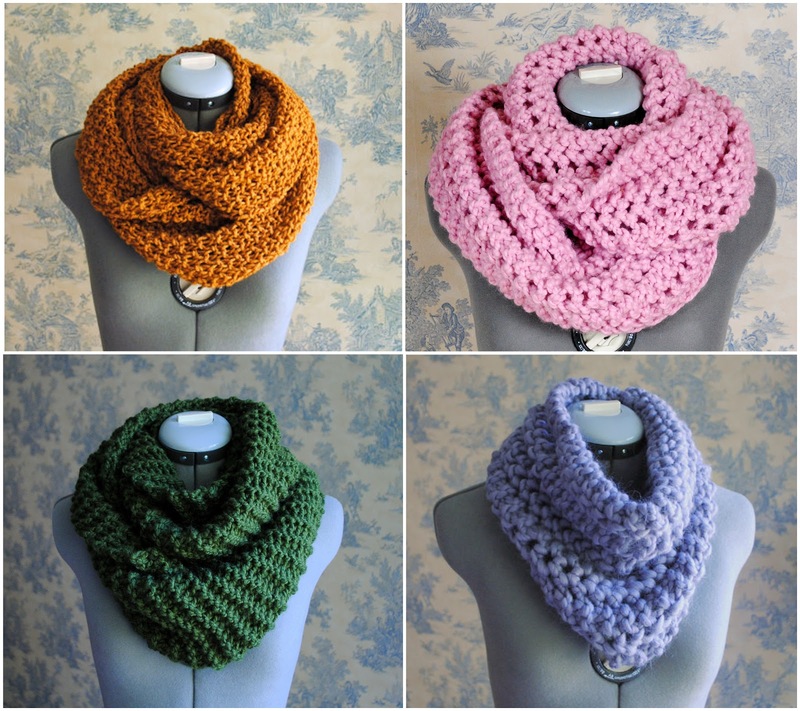 In the past, I mainly knitted things for friends and family to give as a gift, but it wasn't until about a year or two ago that I started selling to the public. At a certain point I realized what my real passions were, which oddly were the same as when I was a little girl: knitting, sewing, reading, writing, and watching plants grow. Nostalgia plays a huge role in everything I do. I am greatly inspired by the past and try to reflect this in my knitting with a strong sense of craftsmanship and attention to quality. I like the idea of there being a movement to bring back good old-fashioned skills. For me, there is nothing more satisfying than making something myself, whether it be dinner or a scarf. To be honest, you can buy a similar looking scarf at a store, but it is the careful and tedious attention to quality, craftsmanship, and detail that sets handmade items apart. Also, the option of getting something custom made is worth a great deal. You can order a custom made item from my shop and choose the exact color you like, the exact type of yarn, and the exact size or shape. I want my items to become a staple in your closet, something that you will have for years and years and will always go back to. I strive to create pieces that are reliable and classic. All my knitting happens while cozying up on the couch in my little apartment, surrounded by shelves full of yarn. I actually enjoy the clutter of craft tools — knitting needles, yarn scraps, crochet hooks, scissors — they make me feel at home. I feel most successful I am busy. I love to be overwhelmed with special orders, a stack of packages to take to the post office, or piles of yarn waiting to be turned into scarves. I feel fulfilled when my scarves are in demand, and it feels even better when past customers come back for more or tell me how happy they are with their purchase. Knitting makes me feel sane. My hands and neck are constantly sore but still I sit and knit with a sense of urgency. I do this because I love working towards something that is mine, something that no one can take away from me. When you work for yourself, your business becomes an extension of you. I love that I am the production department, the photographer, the marketing department, the shipping department, you name it. It may sound strange, but somehow I feel that I can knit my way to a better place. The process is my favorite part. Typically, it involves me getting myself a large cup of tea, sitting on the couch in my little apartment, and knitting while watching old movies (mainly anything with Fred Astaire), until my hands can no longer take it. 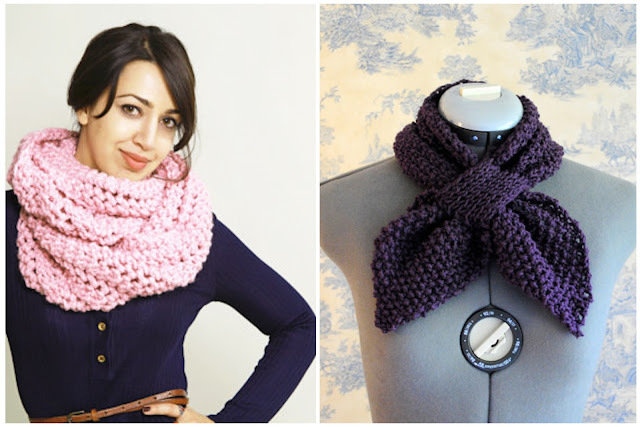 It takes me anywhere from two to five hours to make a complete scarf, depending on needle size and yarn weight. I like working with luxurious yarns: baby alpaca, angora, and wool blends are my favorites. Thanks so much, Soli. If you have any more questions for Soli, fire away in the comments below. Also, be sure to check out her Etsy shop, as Soli is very generously offering Dear Edna readers 15% off their purchase with the coupon code DEAREDNA. Her scarves would make great Christmas gifts!